The complete results of the October 2014 Professional and Sub-professional tests of the Civil Service Examination were released by the Civil Service Commission (CSC) on Tuesday, December 9, 2014. Takers of the Career Service Examination – Paper and Pencil Test (CSE-PPT) may now check online for the examination rating report. 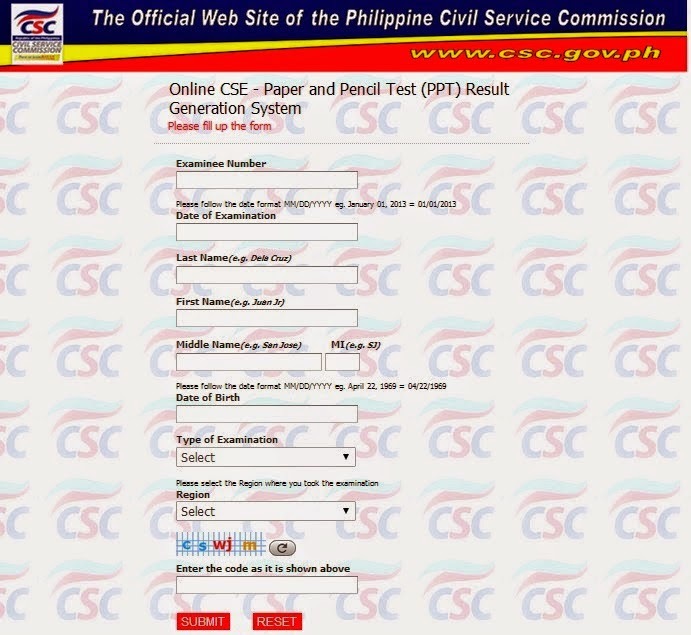 CSC said that passers of the the CSE-PPT exam must personally claim their Certificates of Eligibility (COE) at the CSC Regional Office/Field Office upon presentation of required documents. For Region 5 passers, release of the Certificates of Eligibility is tentatively scheduled between January 15-23, 2015 in various Civil Service Commission field offices in the Bicol Region. More details here. Note: Updates for the availability of COE for other regions will be posted here once available online.